Denver converted 24 3-point goals in a 132-110 victory over the Golden State Warriors on Feb. 13. That performance tied the NBA record for the most 3-pointers in a game originally set by the Houston Rockets. 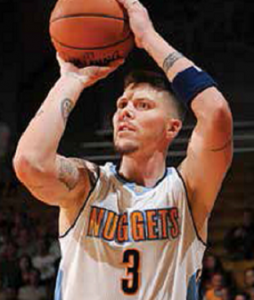 Mike Miller went 2-for-2 from long range to help the Nuggets to the record before a sellout crowd of 19,941 at the Pepsi Center in Denver. 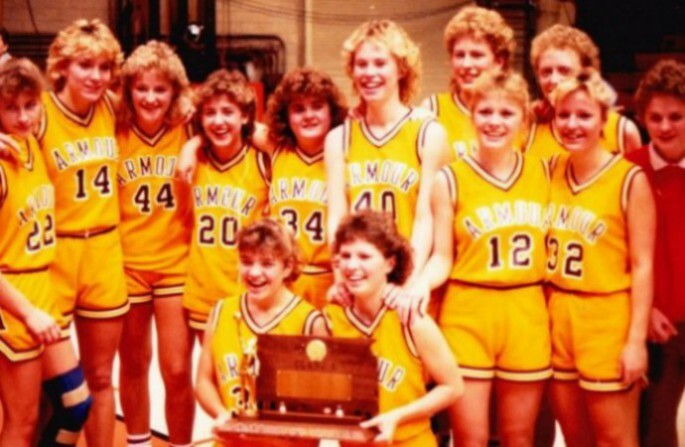 The 6-foot-8 Miller is a former Mitchell High School standout who was chosen Class AA first team all-state for the Kernels in 1996, 1997 and 1998. He played collegiately at the University of Florida and was inducted into the South Dakota High School Basketball Hall of Fame in 2013. Miller is in his 17th year in the NBA and has now moved within 35 points of the 11,000 career-point plateau. He has scored 10,965 points and is a career 41 percent shooter on 3-pointers with 1,588 goals. Before joining the Nuggets prior to last season, Miller had spent time with Orlando, Memphis, Minnesota, Washington, Miami and Cleveland. Thirteen former greats have been selected for induction into the South Dakota High School Basketball Hall of Fame in 2017. The eighth annual induction banquet will be at 1 p.m. on March 25 at the Ramkota Hotel in Sioux Falls. * Joe Ashley, Pierre (Pierre 1979): The 7-foot Ashley recorded 405 career blocked shots and led the Governors to the Class A state title as a senior. He played collegiately at Iowa State University and South Dakota State University. * Ron Bertsch, Yankton (St. Lawrence 1961): Bertsch ranked among the state’s career scoring leaders with 2,012 points for the Wolves. He established a Yankton College record when he netted 1,606 points as a Greyhound. * SuAnne Big Crow (Pine Ridge 1992): The late Big Crow scored 2,541 career points and led the Lady Thorpes to the Class A title in 1989. She tallied a state girls single-game record 67 points and was first team all-state three years. * Jerry Buri, Montgomery, Texas (Hazel 1960): After scoring 1,937 points for the Mustangs, Buri was a three-year letterman at South Dakota State University. He helped the Jackrabbits to the 1963 NCAA College Division title. * Kriss Edwards, Seattle, Wash. (Watertown 1977): Edwards was a talented point guard who led the Arrows to the Class A title in 1976. She went on to set University of Nebraska-Omaha career records for both assists and steals. * Gary Evjen, Sioux Falls (Sioux Falls Washington 1968): Evjen averaged 15 points per game as a Warrior senior. He had 2,288 career points at Northern State University and was all-South Dakota Intercollegiate Conference four years. * Terry Jordre, Aberdeen (Corona 1957): A skilled floor leader, Jordre was also a defensive specialist for the Midgets. While at Northern State University the Wolves won four South Dakota Intercollegiate Conference titles. * John Lillibridge, Burke (Burke 1958): Lillibridge achieved career totals of 1,984 points and 1,008 rebounds for the Bulldogs. At the University of South Dakota he played basketball and was a record setting discus champion in track. * Guy Mackner, Sisseton (Sisseton 1965): A stalwart for the Redmen and an all-North Central Conference player for South Dakota State University, the 6-foot-7 Mackner was selected by the Atlanta Hawks in the 1969 NBA Draft. * Donna Muir, Norfolk, Va. (Cheyenne-Eagle Butte 1978): First team all-state three years, Muir averaged 23.2 points per game for the Braves in her senior season. She played for the Lady Statesmen of Delta State University (Miss.). * Ann Pancoast, Ballwin, Mo. (Sioux Falls Washington 1981): Pancoast and the Warriors were 23-0 and Class A state champions in 1980. She was then all-North Central Conference three years for the University of South Dakota. * Jim Schmidt (Dell Rapids St. Mary 1941): Known as “Sunny” Jim, the late Schmidt was all-Catholic state tourney four years. While at South Dakota State University he was North Central Conference scoring champion twice. 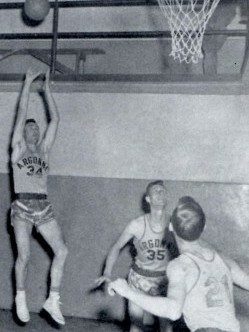 * Mike Sisk, Mesa, Ariz. (Miller 1957): Sisk averaged 18 points per game in his final two seasons as a Rustler. He was a three-year South Dakota State University starter as the Jackrabbits won North Central Conference titles each season. Are you familiar with the inspirational story of Jimmy Lovley? As a young man in 1920 he left the small eastern South Dakota town of Elkton. His destination was Omaha where he became a Creighton University basketball immortal. Lovley was an All-American and the only South Dakotan inducted into the prestigious Helms Foundation Basketball Hall of Fame. His career was legendary and is merely a single thread in the tapestry of basketball history in our state. The South Dakota High School Basketball Hall of Fame is proud to offer a speaker’s bureau to help you learn more about the state’s rich basketball heritage as well as the creation and evolution of the Hall of Fame. If you are a member of a civic, church, school or social group that would like to schedule a free presentation contact Executive Director Dave Wagner by email at dlwagner@tnics.com or by telephone at 605-467-3010. Fifty years ago Tripp High School was preparing to open a season that would end with Coach Jim Flevares and his Wildcats cutting down the nets at the Sioux Falls Arena as undefeated Class B state champions of 1967. It was a memorable tournament because of Tripp’s 28-0 record and the unprecedented 103-point scoring of Mike Freier. State tournaments in South Dakota date back to 1912 and until Freier no player had ever reached 100. The Wildcats topped Beresford in the first round as Freier had 32 points. He went for 36 in the semifinals against Frederick. Tripp beat Herreid 72-46 in the finals as Freier scored 35. In the tourney the 5-foot-9 guard shot 93 percent on free throws (25 of 27) and 62 percent from the field. Many of his shots were long range before the 3-point goal. Freier played one season at the University of South Dakota and then finished his career as a standout at Yankton College for the Greyhounds. He was inducted into the South Dakota High School Basketball Hall of Fame in 2015. With the 2016-17 college season nearing tip off, there are coaches in the Power 7 conferences whose basketball roots can be traced back to their careers as outstanding high school players in South Dakota. Programs at the University of Nebraska of the Big Ten Conference are led by men’s coach Tim Miles and women’s coach Amy (Gusso) Williams. Miles is a native of Doland and Williams is from Spearfish. Miles is entering his fifth season guiding the Cornhuskers. In his 22 years as a collegiate head coach, spent at five different schools, he has a 346-287 record. Williams is beginning her first season at Nebraska. She is 193-109 overall in nine years as a head coach, including 96-44 during the past four seasons at the University of South Dakota. Mitchell product Ryan Miller serves as an assistant at Texas Christian University of the Big 12 Conference. Joe Krabbenhoft, who prepped at Sioux Falls Roosevelt, is an assistant at Big Ten member University of Wisconsin. Other conferences in the Power 7 are the Atlantic Coast, Atlantic 10, Big East, Pac-12 and Southeastern. The South Dakota High School Basketball Hall of Fame’s presence at the Sanford Pentagon has been significantly enhanced by the recent progress that has been made on three important projects. Six panels featuring 8 x 10-inch images of state championship teams are now on display in corridors along the second floor. Each panel is 40 x 70 inches. Pictures depict each boys and girls champion from the first one-class tournament in 1912 through the end of the two-class system in 1985. 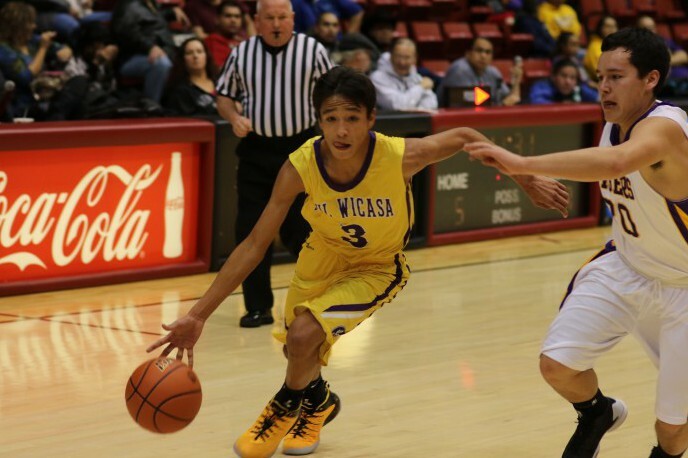 A seventh panel will soon recognize champions of the Catholic state tournament that played a prominent role in South Dakota basketball history from 1937 through 1964. A separate display recognizes those special teams which compiled undefeated records during their title seasons. This exhibit was made possible by the generosity of Nancy Swett, wife of the late Hall of Fame member Rex Swett. Another display chronicles the evolution of venues that have served as sites of state tournaments. Included are rare photos of Daum’s Auditorium in Huron, where the first tournament was held in 1912, and Spafford Hall in Aberdeen. The Hall of Fame’s main exhibit area is on the first floor of the Pentagon near the main entrance. The seventh annual induction ceremony and banquet was held by the South Dakota High School Basketball Hall of Fame on April 2. The event was at the Ramkota Hotel in Sioux Falls. Welcomed into the Hall of Fame during the banquet were 19 former greats. They expand membership to 117. To read bios of all members of the Hall of Fame click on Inductees on this website. The Class of 2016 is, from left, in front, Scott Morgan, Mitchell ’89; Chris Miller, Stickney ’71; Dale Hall, Ravinia ’54; Holly (Sivesind) Borchers, Roosevelt ’93; Lolly Steele, Pine Ridge ’84; and Roger Faber, Canistota ’58. In back are, Mason Hecker who was representing his late father Fred Hecker, Washington ’57; Dodie Bemis, who was representing her late father Bob Marske, Andover ’44; Matt Jones, Alpena ’01; Vince Gauer who was representing his late grandfather Bob Marske; Josh Mueller, West Central ’01; Steve Jansa, O’Gorman ’64; Harley Zephier Sr., Dupree ’55; Elton Byre, Reliance ’56; Maury Haugland, Murdo ’54; Amy (Allard) Carmody, Jefferson ’82; and Melissa (Olson) Guebert, Lincoln ’83. Also inducted was Wayne Rasmussen, Howard ’60, who is shown at right. Completing the Class of 2016 were the late Conrad Collin, Huron ’30; and the late Rudy Soderquist, Rapid City ‘37.